Here is where we stand prior to part 2. Sumdac has found Megatron's body and is trying to rebuild it. Megatron realizes Sari's key would accelerate repairs, so he contacts Lugnut and orders him to retrieve it. Starscream, now considering himself leader, thinks it's a hoax and tracks down the signal. Meanwhile, the Autobots are having a fall-apart meeting and in the process alienate Sari by taking the key from her. She eventually gets captured by Blackarachnia, who also wants the key to cure her condition. We pick up on the story when Megatron is hovering over the Sumdac tower. 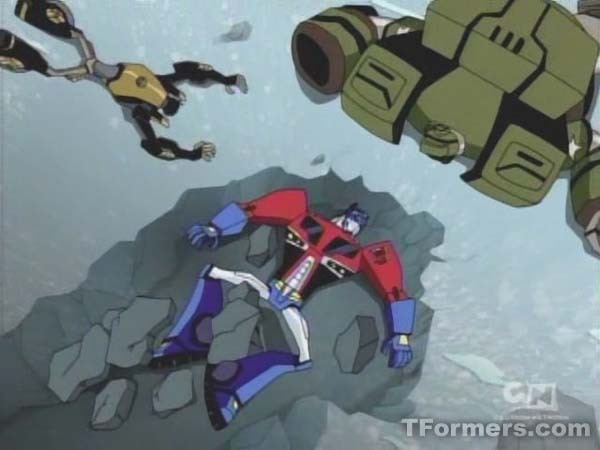 As he lowers himself towards the ground, the Autobots continue to be dumbfounded as to how he is still functional. 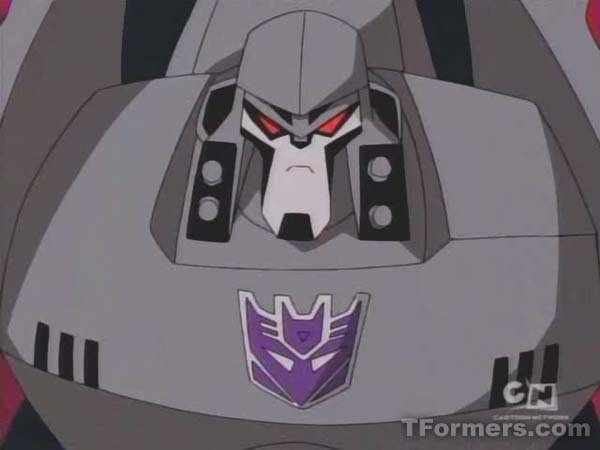 As he lands, Megatron has a battle-ready and determined face on him. The Autobots begin to face off with Megatron. Bulkhead leads the assault by launching his mace ball (which Megatron easily slices off) and then by a full out change. Megatron easily launches Bulkhead into the next city block with one effortless swing of his arm. Next up: Prowl. Prowl begins with launching his shurikens. 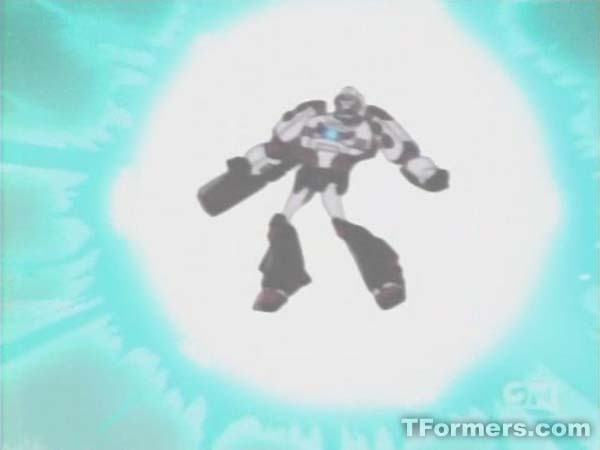 Megatron uses his sword as a rotor to deflect the projectiles, then begins swinging at Prowl. As Prowl dodges the attack, Megatron makes mincemeat (with only 2 swipes) of a support beam of an overpass. 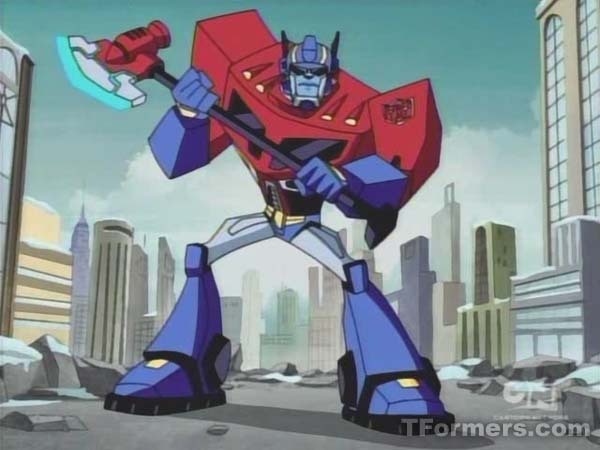 Optimus spots 2 kids in the path of the crumbling structure, and "borrowing a move from the Bumblebee playbook" uses his foot wheels and his axe (as a rocket booster) to speed over and scoop the kids out of harms way. Cut back to Prowl, who is now under Megatron's heel. Megatron is ready to repay Prowl for severing his right arm 50yrs prior and prepares to use his sword to do the trick. As Megatron bears his sword down on Prowl, Prime's axe intercepts the blow, knocking the sword out of Megatron's hand (with help from his grappling rope). Prime tells Megatron he'll have to wait a little longer (to deal with Prowl) as he readies his axe for battle. As Optimus leaps in the air and powers the rocket booster for a power swipe at Megatron, the axe simply hits Megatron's forearm without any conceivable damage. 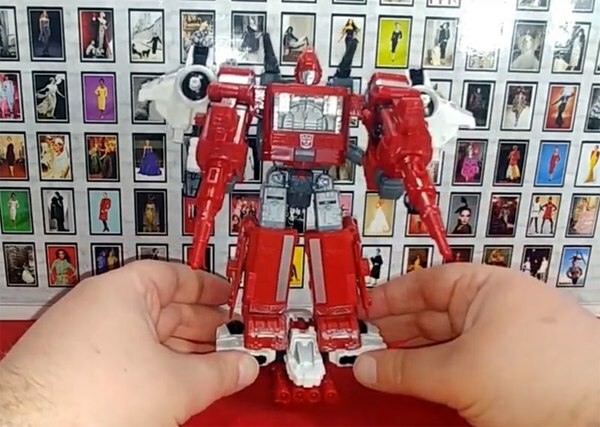 At this point, we get a real idea of the size difference between Megatron and Optimus Prime.... almost double! As Megatron kicks Prime out of the way, he begins to retrieve his sword. Prime launches his grappling rope and binds up Megatron's legs before he can reach the sword. This barely slows down Megatron. With one tug from his left hand, he severs the cable from his legs. Then, he whips the cable and flings Optimus into a nearby building. From atop Sumdac tower, we see Blitzwing (in rage mood) and Lugnut observing the carnage being laid out in the streets. Blitzwing wants to join the fight, but Lugnut stops him. As they argue, we see Sumdac trying to escape via the roof access. However, Blitzwing stops him and, in his cold mood, telling him to surrender. In another section of Sumdac Tower, Starscream is still locked in battle with Bumblebee. As Starscream laments about his failed opportunity to take Megatron down, he considers his options. Does he help the Autobots take Megatron down or bide his time? He considers these options while tossing Bumblebee around like a juggling ball. Back on the ground, Megatron is still dishing out hurt on Optimus Prime. As Prime tells Megatron he will fight until the end to protect the Allspark's location, Megatron advises Optimus that he now has the Key, which will give the location for him. 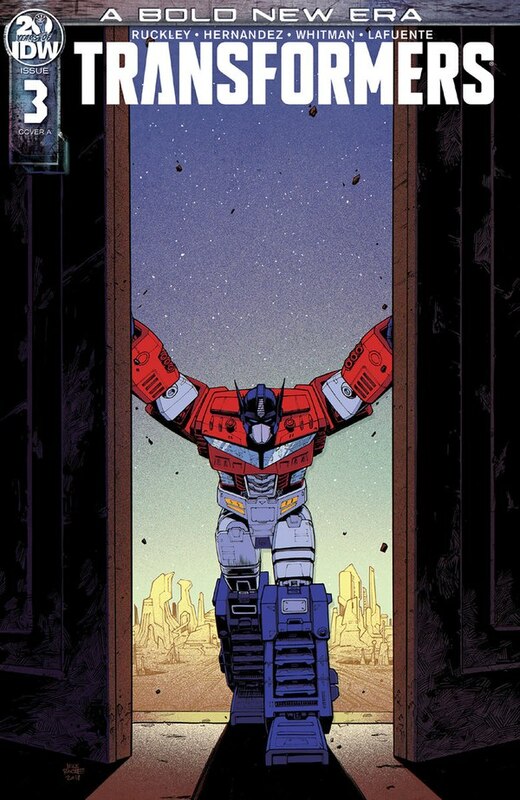 As Prime rushes Megatron, one punch from Megatron's hand burrows Optimus several hundred feet to lay him to rest near the rest of his fallen soldiers. The battle is over, and the Autobots were severely outmatched by Megatron alone. Megatron declares role call for his army, and the pair of Lugnut and Blitzwing immediately respond. 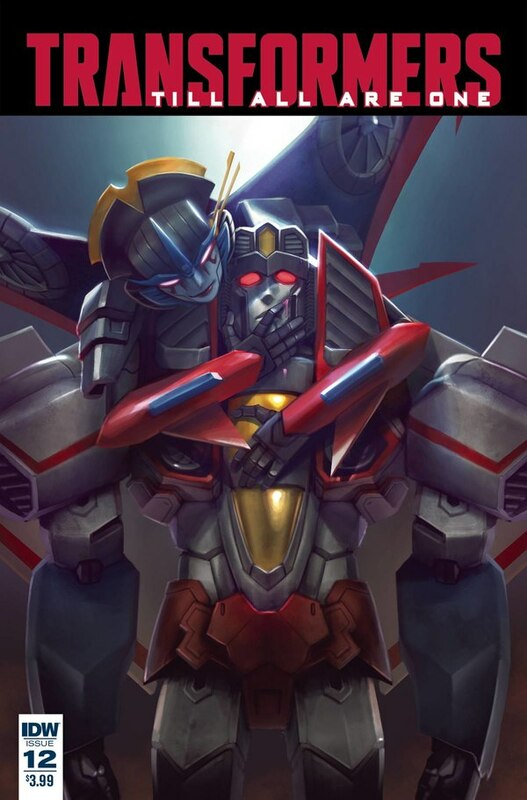 Starscream, seeing how the events have played out, makes his decision and tosses Bumblebee to the side like refuse. Blitzwing and Lugnut land at Megatron's side. As Lugnut goes into his hero worshipping bit, Starscream lands on top of him, declaring his 'loyalty' to Megatron and trying to re-establish his vice command. However, Starscream still doesn't realize that Megatron knows the truth about his treachery. Megatron mentions that it's time to serve his revenge against the one that disabled him 50yrs ago. 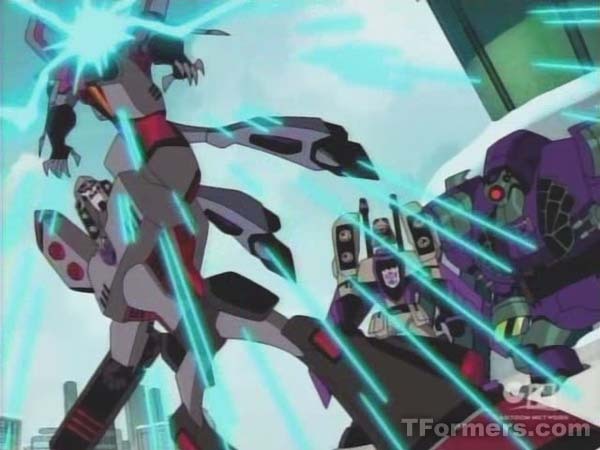 As Megatron powers his fusion cannon and points it at Optimus Prime, he uses his left arm to grab Starscream and, with the key in hand, takes Starscream offline. As Megatron reaffirms his status with the remaining 2 Decepticons, he notices the Autobots have escaped. Blitzwing switches to his rage mood and is ready to hunt them down. However, Megatron treats the Autobots as a insignificant instead, insisting the Allspark is their priority. Besides, Megatron believes they are not long for this world anyhow. Megatron then commands "Transform... and rise up!". 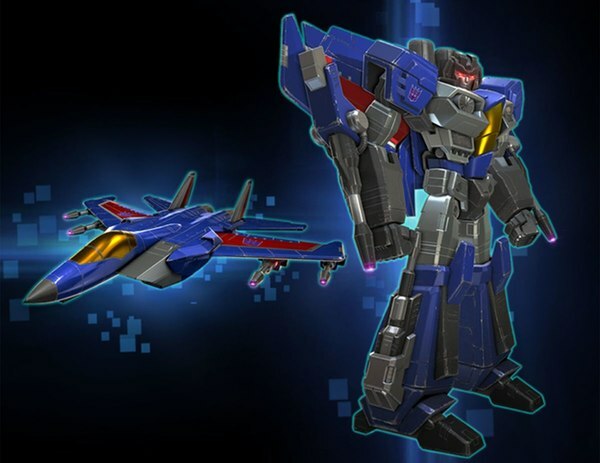 As Blitzwing, then Lugnut, transform into their respective jet modes, we get to see a detailed sequence of Megatron's first transformation into his rotor plane mode. Inside Sumdac Tower, we see that the Autobots retreated to take refuge in the lobby. Sumdac comes running down and immediately apologizes to the Autobots. Prime tries to tell Sumdac it's not his fault, but then Sumdac exposes his unintentional role in reviving Megatron thru a flashback. He also tells the Autobots that his whole career is based off of reverse-engineering Megatron. This serves to infuriate the Autobots, who don't believe that Sumdac was deceived by Megatron. Optimus breaks the mood by trying to focus on keeping the Allspark out of Megatron's hands. However, they all admit that they are in no condition to transform, let alone fight. Sumdac thinks about this and theorizes that Sari's key may have left enough residual energy to help the Autobots repair themselves. 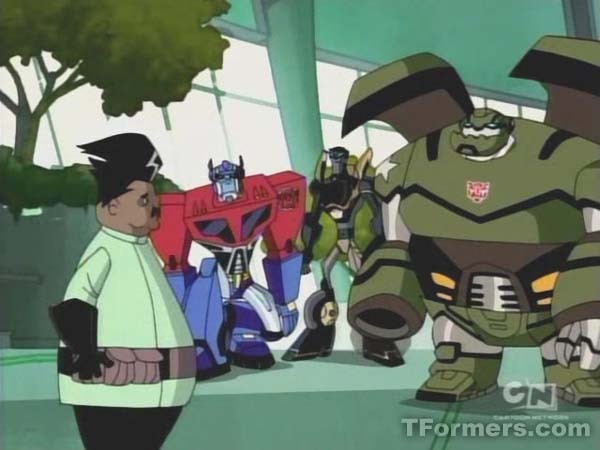 Prime agrees that it's worth a try and directs the Autobots to help Bumblebee off the roof before they attempt repairs. Ratchet does a security sweep and commands Teletraan I to launch a SkySpy satellite. The satellite picks up on Blackarachnia approaching the ship... with Sari riding on top. BA and Sari are bickering over the exact location of the ship. Sari continues to test BA's patience and even a transformation into her robot mode doesn't phase Sari. As BA continues to threaten Sari for the location of the key, she realizes Sari has led her in circles. Sari finally gives BA a hint ("How long can you hold your breath?") and as BA realizes that her organic half can't hold it's breath that long, the ice beneath her shakes. 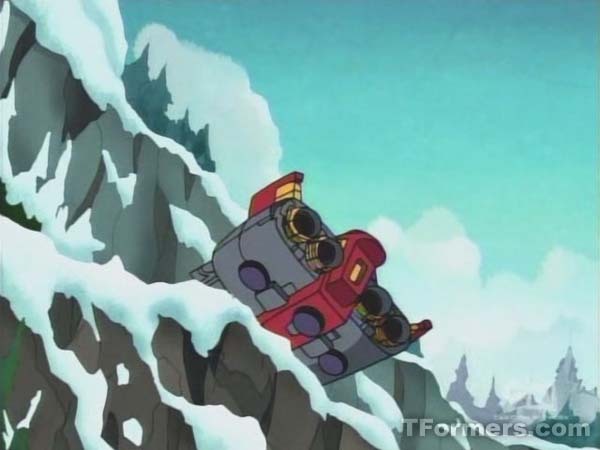 The ice breaks away to reveal the Autobot ship becoming airborne. Sari uses the distraction to bite into BA's hand, releasing her. Ratchet is at a nearby door to grab Sari and pull her in before locking the door again. As BA attempts to open the door, Ratchet increases thrust blowing BA off the ship and towards the ground. As Sari convinces that her association with BA was a distraction, Ratchet lets on that the Autobots are in trouble. Sari mentions using the key, which is when Ratchet chimes in that he lost it. Sari starts to give him the third degree until Ratchet mentions he had rather face Megatron alone than break the news to her about the key. At that time, Sari notices the monitor and Megatron (with the other Cons) approaching the ship, where she notes to Ratchet that he might have that chance. Back at Sumdac's lab, Sumdac puts the finishing touches on repairing Optimus. Prime notes that the repairs aren't full, but they helped stabilize their condition. Prowl shows his dour mood, saying that none of them are exactly Academy material. Bumblebee rubs in reminding Prime of how he termed them earlier as "a bunch of undisciplined, insubordinate malfunctions". Prime confesses that those remarks were out of line and asks them to help him repair their friendship. As they seemingly begin to mend things, Ratchet radios in alerting Prime that 3 Decepticons are on his tail. Prime commands Ratchet not to engage them, advising him that they need to try and lead the Cons off the planet first. Ratchet acknowledges. At this point, Sumdac insists to help the Autobots, being that he was the one that brought Megatron back online. 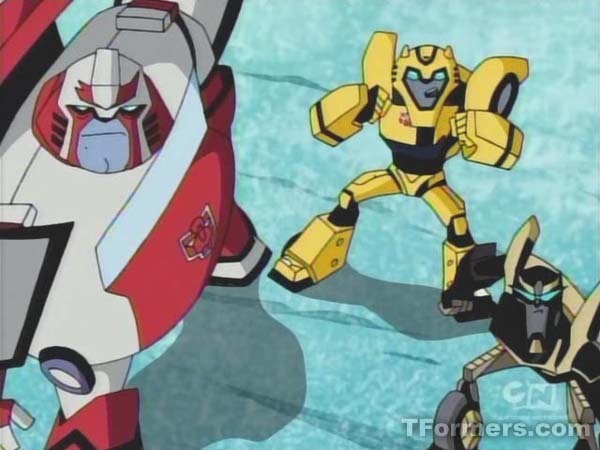 As the Autobots ponder how Sumdac can play a role in helping them, Bumblebee voices his concern about Sari. Just then, the ship arrives, with Sari answering Bumblebee's question with "What about me?" As Sari begins quipping at the Autobots, the Decepticons begin attacking the ship. Ratchet insists they board the ship, which they do. Jetting away from the tower, the ship begins an immediate orbital ascent. Megatron notes that the Allspark is still on board and tries to chase the ship. As Ratchet increases thrust and launches the crew rudely into the walls of the Bridge, Sumdac again goes into self-pity mode. Sari finds out that her dad was responsible for rebuilding Megatron and begins to rile him about it. 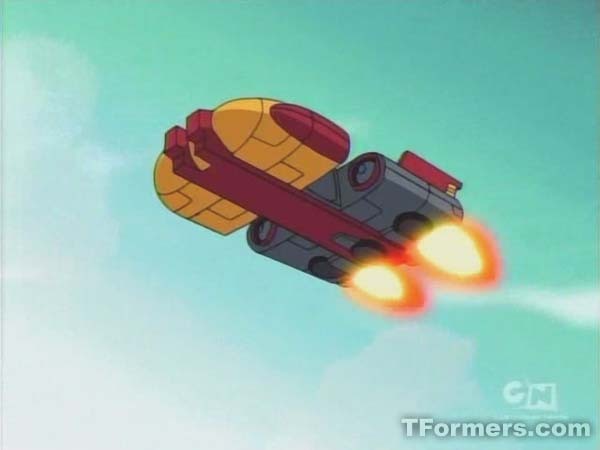 However, the arguement is cut short as a trio of Decepticon missiles strike the Autobot ship and send it out of control. The next minute or so is spent trying to stabilize the ship from a helpess freefall. 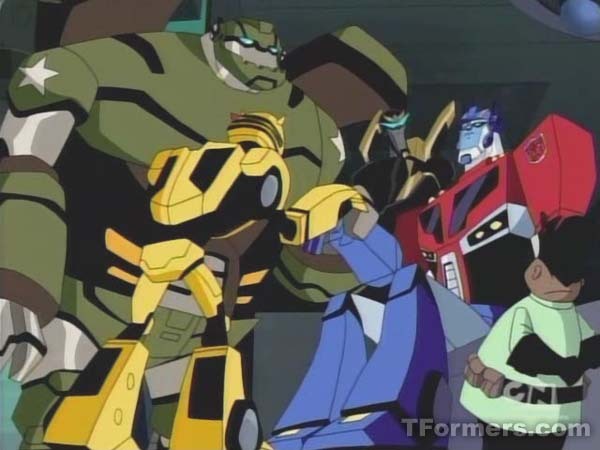 As Ratchet tells Prime that his plan to leads the Cons off the planet will have to be revised, they gain some control of the ship shortly before reaching the ground. As the ship heads towards Dinobot Island, skimming the ice of the lake, it launches off of the shore of the island and slings them right into the side of the crater in the middle of the island. The Decepticons waste no time catching up with the ship and launching an attack on it. Prime advises the Sumdacs to stay on board as they go to confront the Decepticons. Prime leads the Autobots to the top of the crater and gives them a pep speech. He tells them he wouldn't want to fight by anyone else's side, to which Bumblebee mentions his wish that the Elite Guard were handy. The pep talk is cut short by the Decepticon's approach. 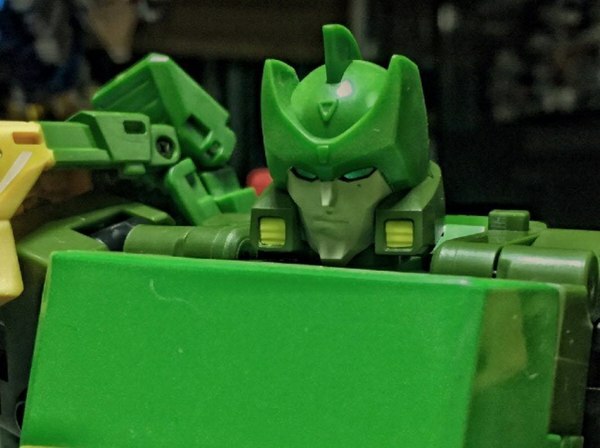 Bulkhead launches himself into the air, tackling Lugnut in his alt mode and riding him down into the forest below. As Blitzwing pulls around for another volley, Bumblebee combines his stinger with Ratchet's remaining magnet claw to create an EMP to short out Blitzwing's electrical circuits, which sends him nosediving to the surface. Lugnut, now in robot mode, has Bulkhead hoisted over his head. As he goes into a speech about challenging Megatron's rule, Lugnut tosses Bulkhead into a nearby grove of trees. Preparing his rocket punch, Lugnut's tirade proves to be his downfall as Bulkhead launches a mace into the punch's trigger button, launching Lugnut into the air and out of sight. In another section of the island, Prowl, Ratchet and Bumblebee search for Blitzwing. Thinking he's gone down in the area, Blitzwing emerges in tank mode firing on the Autobots. As the Autobots speed off, Blitzwing is having trouble keeping traction on the ice and switches to Jet mode to fight the Autobots via the air. Megatron continues his advance towards the ship and Optimus uses a grappling hook to secure himself onto Megatron's tail. Then, he powers up his Axe and launches it into one of Megatron's exhaust ports, making him lose control. Sari watches over a monitor and runs off towards the Allspark. Sumdac, in the process of building something, doesn't seem confident that they'll survive the onslaught and wants to tell Sari something important. 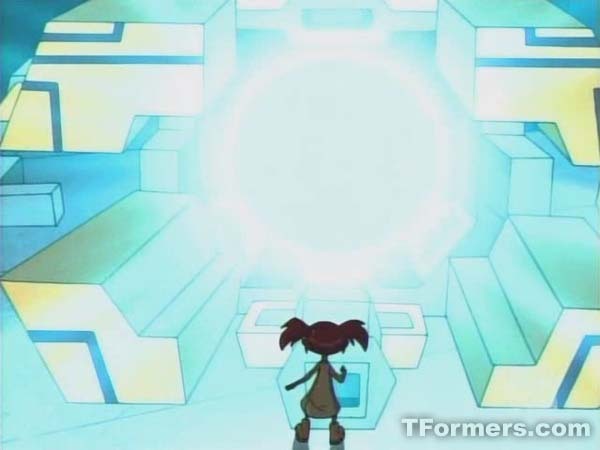 However, she is more focused on getting to either the key or the Allspark to help repair the Autobots and runs off. 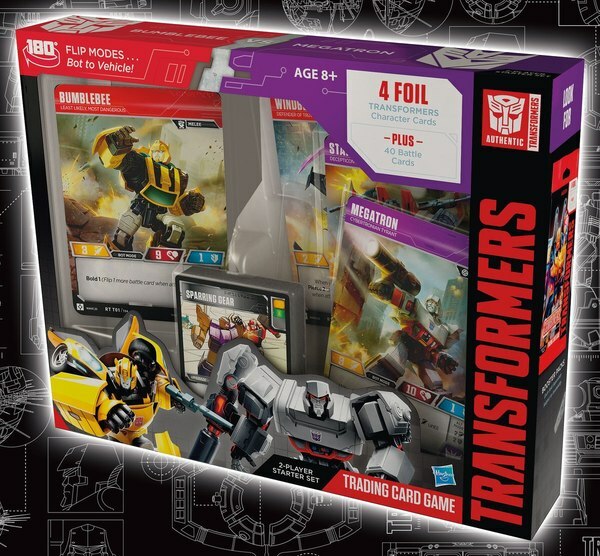 As Ratchet, Prowl and Bumblebee take refuge from Blitzwing, they try to devise a plan to take him down. Prowl has seemed to notice a connection between Blitzwing's alt modes and his moods (cold = jet and rage = tank) and thinks they can defeat him by changing his moods and therefore... his alt mode. Prowl then divulges that the plan will require Bumblebee's best attribute. 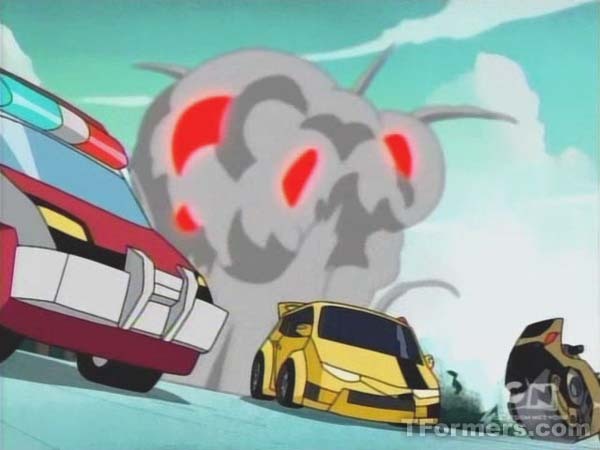 Bumblebee, thinking his best attribute is his stingers or his speed, is disgusted to find out that his "obnoxious personality" his is best atttribute. Bumblebee goes off to confront Blitzwing, still in jet mode, by taunting him continually. Finally, Blitzwing works into his rage mode, transforming into his tank mode (while still in midair) and dropping like a lead weight. Back on the ship, Sari tries to open the Allspark's case. As Sari shows frustration over the case not responding, it suddenly opens up. It shows a holographic image of a DNA cluster, but Sari doesn't "have time for Charades". Back outside, Megatron tells Prime that his team is a distraction and assumes his robot mode in another detailed transformation sequence. As the Allspark case closes up, Prime launches Megatron through the hull of the ship into the chamber containing the Allspark. This pleases Megatron, who tells Prime that their battle will end where it began. 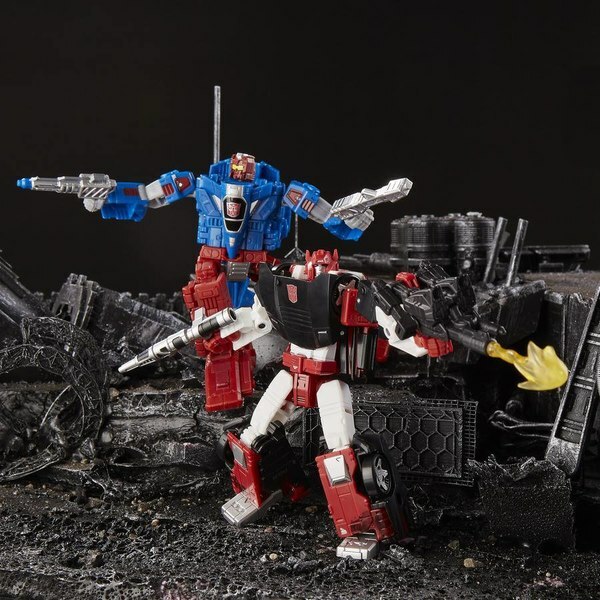 Kicking Prime against the wall, Prime tries to launch a pair of grappling ropes at Megatron. Instead, Megatron ties Prime up in his own ropes and throws him against the wall. Sari tries to guard the Allspark, but Megatron sweeps her off like dust. Megatron relishes the fact that, after four million stellar cycles, he has possestion of the Allspark. He then proceeds to merge the Allspark with his own spark core. He then divulges that he will use the Allspark to reclaim Cybertron for his own, but not before destroying Earth. As Megatron begins to walk off, he short circuits and falls on both knees to the floor, dropping the key in the process. Sumdac, with a prod, is the one that made Megatron drop. Sumdac says that after 50 years of reverse engineering, he knows a way to disrupt his equilibrium, comparing it to an Achilles Heel. As Megatron recovers, he goes into a speech about how Cybertronian technology can not be compromised by humans. Sari uses this change to recover the key without Megatron noticing it. As Megatron motions to crush Sumdac under his 'Achilles Heel', Optimus Prime leaps at Megatron. Megatron then uses the power of the Allspark to pin Optimus to the wall. As Megatron tells Prime that he has no idea of the Allspark's power, Sari throws her key into Prime's hand. 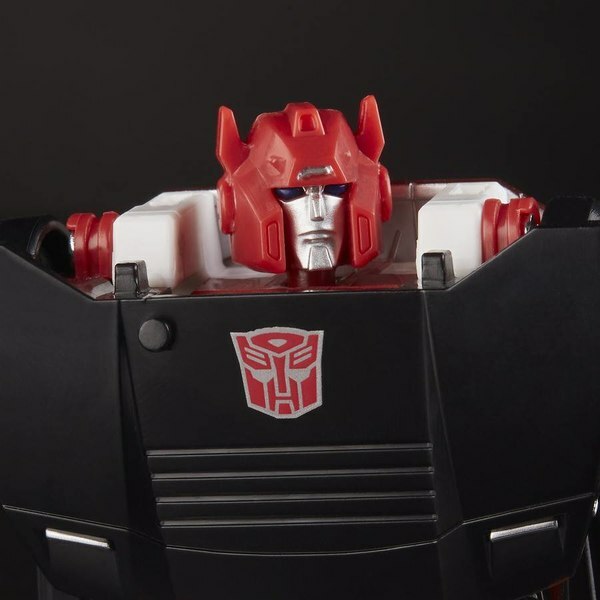 Prime exclaims "You want power? Then have your fill! ", he thrusts the key into the Allspark, breaching the casing and overloading Megatron. Megatron falls in front of Sumdac. As Megatron tries to regain his composure (clutching his left fist), Sari opens the airlock and Prime butts Megatron out in the open. Shortly thereafter, we see Megatron going into critical overload. We then see an explosion coming from the crater. Shortly after these events, Sari and Optimus Prime are seen at the ship. Sari asks Prime if the Allspark is destroyed. Prime seems to think the Allspark was merely disbursed, making the key the single most powerful Cybertronian artifact. In his own way of apologizing, Optimus Prime hands the key back to Sari, telling her that the key can't be possessed by any mere Autobot. As Sari wraps up repairs, Prime tells his team he is proud of their performance. As Bumblebee tries to goad Prime to expand on that pride, Sari tries to find out where her dad might be. On the shore of the island, we see Megatron, crouched over with considerable damage. In his left hand, we see Sumdac shaking in fear. It seems that Megatron's fate and Sumdac's fate are again intertwined. Seems this episode turned out differently than some people hypothesized. For one, no Dinobots were shown... even though the climax of the episode was on Dinobot Island. Also, the events with Black Arachnia played out disappointingly thin. 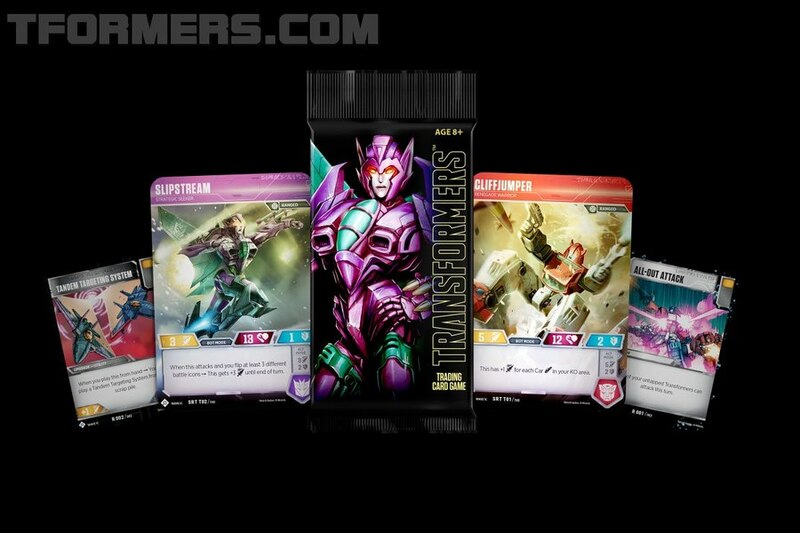 As we stand now, Megatron is severely damaged, Starscream is seemingly offline and the rest of the Decepticons are unaccounted for. The Autobots have reconciled with one another and, although they have lost the Allspark, still have the key. 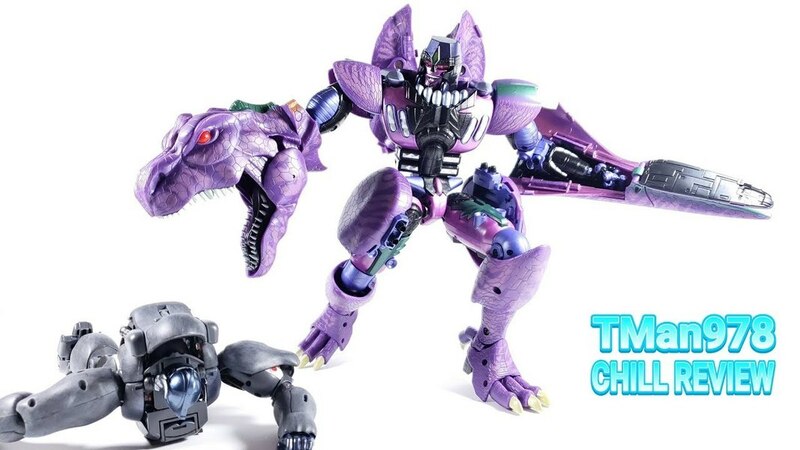 It will be interesting to see how the events play out now that Megatron has no Allspark to chase. BWBM will guide you through the next 2 episodes, beginning next week with the arrival of the Elite Guard.